Denton Oil Change - Oil changes, oil change by Denton Oil Change, Denton, TX. In internal combustion, there’s microscopic particles from black soot that accumulate in the oil during operation. Also the rubbing of metal engine parts produces microscopic metallic particles from the wearing of the surfaces. These particles circulate in the oil and grind against the part surfaces causing wear. The oil filte removes many of the particles and sludge, but eventually the oil filter becomes clogged, when used for extremely long periods. The motor oil and the additives undergo thermal and mechanical degradation. For these reasons, the oil and the oil filter need to be periodically replaced. At Jon’s EZ Lube, oil changes, oil filter changes and maintenance is our business. We’re quick and you’re sure to get an expert oil change with guaranteed results. Some vehicle manufacturers specify which SAE viscosity grade of oil should be used, but different viscosity motor oil may perform better based on the operating environment. We can tell you what oil will work best with your vehicle. 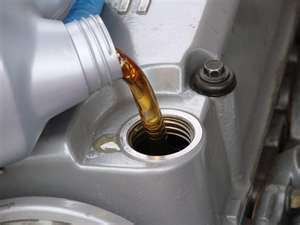 Motor oil is changed on time in service or distance vehicle has traveled. Also important is the quality of the oil used and Jon’s EZ Lube uses top notch oil from all manufacturers. The viscosity can be adjusted for the ambient temperature change, thicker for summer heat and thinner for the winter cold. Time-based intervals account for the short trip driver who drives fewer miles, but builds up more contaminants. It is advised by manufacturers to not exceed their time or distance driven on a motor oil change interval. Short trips, where the oil does not get to full operating temperature long enough to burn off condensation, excess fuel, and other contamination leads to "sludge", "varnish", "acids", and many other deposits. The best preventative maintenance you can do for your car is to keep it running with clean oil and to change your oil filter when you change your oil. At Jon’s EZ Lube you’re assured to get both along with expert advice and guaranteed customer service.